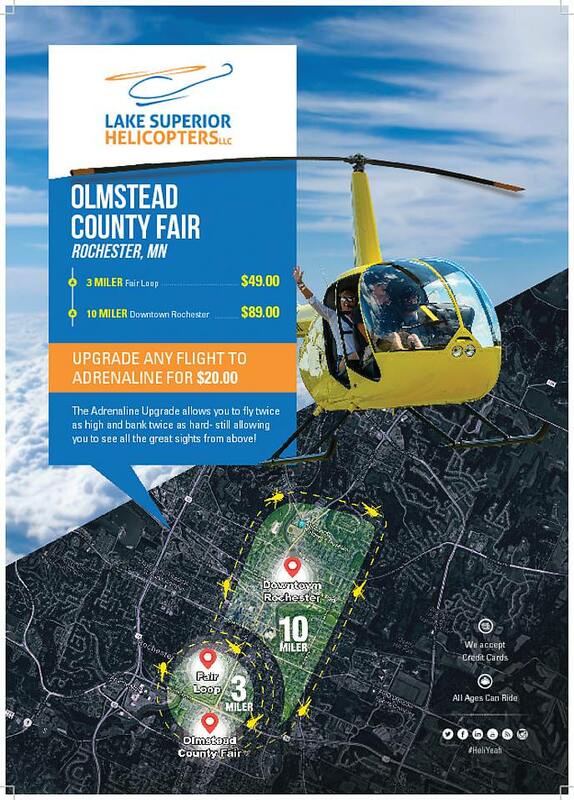 Upgrade Adrenaline – $20.00: ADD TO ANY FLIGHT!! This flight is for you! 30-degree banked turns, fly twice as high and turn twice as hard yet see all the same great sites as the River Run with a little extra flight time! *Add at time of check out! *Weight Restrictions Apply. Please note all routes are approximate. FREE EVENT TO THE PUBLIC! Come on down to Bayfront Park, on the edge of the wildly gorgeous Lake Superior for a weekend of Hot Air Balloons! We will be doing Helicopter Rides first come first served unless pre-booked prior. This year we have NEW TOURS to offer. So if you have flown before , now it is time to experience something new! It's time to get your mud on...and then FLY! We will be at the annual Howie's Mud Bog to take you up over the excitement. This year we are introducing a new routes for 2018! NO PRE-BOOKING. THIS IS A FIRST COME FIRST SERVE TO FLY. We will be giving Helicopter Rides at McLeod County Fair August 17th-19th! Pre-Book your ride today! Come on our the Brainerd International Raceway to unleash your inner speed demon for NHRA Nationals! What better way to feed the adrenaline junkie in you than a helicopter ride over the racetrack! We have a few new routes to debut this year - so let's fly! NO PRE-BOOKING THIS IS A FIRST COME FIRST SERVE TO FLY! Join is as we fly at Lucas Oil's Spring Creek Nationals in Millville, MN! We are back Stillwater! 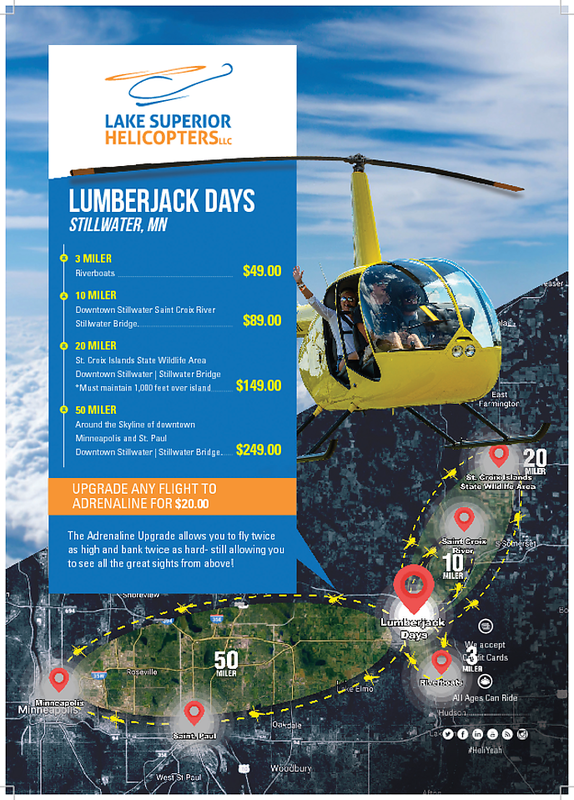 We can't wait to take you up on your adventure over the beautiful Saint Croix River for the annual Lumberjack Days!! 11:00 AM - 6:30 PM Daily! 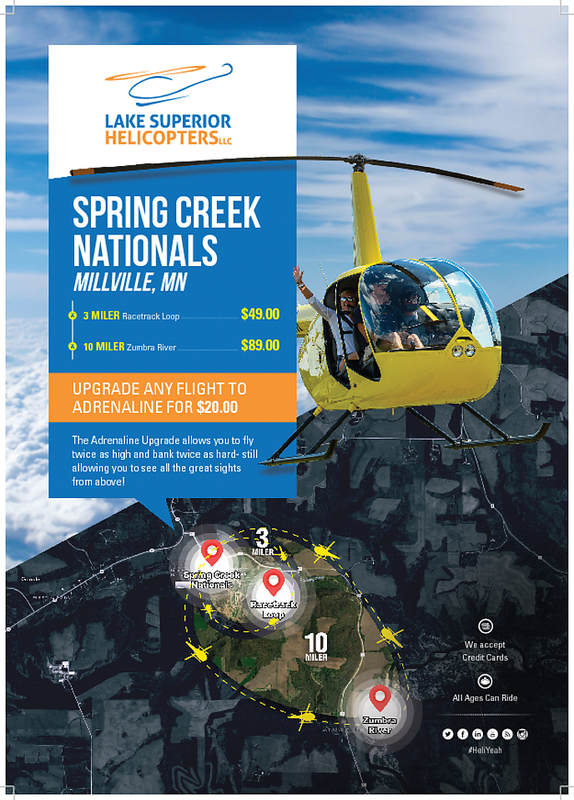 20 Miler [$149.00 Per Ticket] - Saint Croix Islands State Wildlife Area | Downtown Stillwater | Stillwater Bridge *Must Maintain 1,000 feet over islands. 50 Miler [$249.00 Per Ticket] - Orbit the skyline of Downtown Minneapolis and Saint Paul | Downtown Stillwater | Stillwater Bridge. Add this upgrade to any flight and fly twice as high and turn twice as hard! *Add at time of check out! 10% of all tours go to the Stillwater Locals! We are back to Wright County Fair! This year we are offering a NEW tour route and can;t wait to get you above all the excitement. Rides start at $49.00 per passenger and are first come first serve.